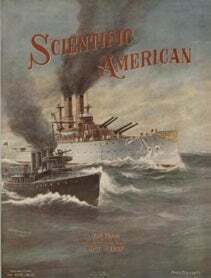 At the time of the Spanish war the United States possessed no torpedo-boat destroyers; but the Congress Copyright 1907 by Loeffler. Displacement, 3,235 tons. Speed, 12 knots. Hnnker Capacity, 40 tons. Armor: Belt, 11 inches; turrets, 11 inches; barbettes, 11 inches; deck, inch. Armament: Two 12-inch 40-caliber B. L.; four 4-inch H. F.; three 6-pounders; six 1-pounders; two Colts. Complement, 137. HARBOR-DEFENSE MONITOR “ARKANSAS.” ALSO “FLORIDA,” “WYOMING,” AND “NEVADA." LONGITUDINAL SECTION, SHOWING INTERNAL ARRANGEMENTS OF TORPEDO-BOAT DESTROYERS. however, will not do away with the use of wood pulp entirely, since only the rougher kinds of wrapping paper and cardboard can be economically made. Coarse papers and cardboards made from peat possess greater strength than similar articles in which straw is the basis. The supply of peat in the world is practically inexhaustible. It is found in all the countries of northern Europe, where it has been used for centuries as a fuel. It is not unusual to discQver deposits many miles in extent and from ten to fifty feet deep. Siberia alone possesses thousands of square miles of this material, and much is known to exist in the United States and Canada. If it helps to produce the coarser grades of paper and thus relieves the pressure upon the tim- by the Krupp process. In each corner of the superstructure is mounted a 4-inch, 50-caliber gun. The vessels have a speed of 12 knots in smooth water. They are purely harbor defense vessels, and in any but a comparatively smooth sea it would be difficult to make accurate shooting with the big guns. Steaming head to sea the decks are constantly submerged, and it would be a problem under such conditions to keep the water out of the turrets. It is certain that no more ships of the monitor type will be constructed for the United States navy. New Forest Reserves Created. President Roosevelt has recently created four new Leh, 240 feet 7 inches. Beam, 22 feet 3 inches. Draft, 6 feet 8 inches. Displacement, 430 tons. HorsePower, 6,425- Speed, 28 knots. TORPEDO-BOAT DESTROYER “MACDONOUGH. &apos; CLASS OF SIXTEEN VESSELS. ber supply, it will do a great deal toward aiding in the preservation of the forests of the United States. The output of coal in Peru in 1906 was 79,900 tons, as against 75,300 tons in the previous year. The output of oil increased from 50,000 tons to 71,000 tons. The greater bulk of the coal was raised in the Cerro de Pasco district. The copper output showed an &apos; increase over the previous year, and amounted to 13,500 tons, this figure including ingots, mattes, and mineral. bird and animal reserves on the Pacific coast, as well as increasing certain forest reserves. The action was the outcome of the campaign undertaken by the National Association of Audubon Societies, to prevent the extermination of the sealion and of certain birds inhabiting the small islands along the northwestern Pacific- coast. One of the reserves on the coast of Oregon embraces a number of rocky islets which are worthless for any other purpose. In spite of this fact, they are inhabited by a vast number of sea birds. The of 1898 authorized on May 4 the construction of sixteen of these vessels. The contracts were signed in the following autumn, and it was not until some four years later that these boats went into commission. The accompanying photograph of the “Macdonough” shows the characteristic features of these craft. They vary in displacement from 408 to 482 tons, on a mean draft of from 6 feet to 7 feet 2 inches; but the full load displacement is considerably greater, varying from 512 to 692 tons. The “Macdonough” is 240 feet 7 inches long, 22 feet 3 inches extreme beam her mean draft is 6 feet 8 inches; her normal dis placement 430 tons, and her full load displacemen 512 tons. She is driven by twin-screw triple expansion engines. Steam is supplied by Thorny croft boilers. Her highest speed on trial was 28 knots on a mean displacement of 400 tons, and this was obtained with an indicated horse-power of 6,425: Her bunker capacity is 110 tons. The&apos; lowest speed obtained on trial by any of these boats was 28.1 knots and the highest 29.69 knots, which was the speed of the “Stewart.” It cannot be said that our destroyers have been very successful. During last summer a race was arranged from Sandy Hook to Hampton Roads, in which several of the boats broke down and the winners fell far below their trial speeds. It is believed by our naval constructors that it is wiser to build larger and stronger boats with greater cruising radius, and be satisfied with a moderate speed of from 24 to 25 knots. It is claimed that such boats could repeat their trial speed in actual service under any but the most extreme conditions, and that they would be free from the ever-recurring breakdowns which render our present destroyers so unreliable. Hence the present intention of the government is to build five 800-ton destroyers in which the weights allotted to hull and engines will be sufficient to render them serviceable in any kind of weather. These boats are to be driven by Parsons turbines. We think it would be wise to add to the displacement, and raise the speed to at least 30 knots. We have also added to the navy 22 torpedo boats of from 150 to 340 tons displacement, and of from 23 to 30 knots speed, the particulars of which are given in the tabular summary of the navy on another page.